There was a lot of discussion about criticizing Ryan Tannehill in my last post and I thought I would demonstrate some of the reasons why I'm beginning to fall off the Tanny train. Here is the breakdown of Tannehill's first 4 passes of the New England game. On Tannehill's 1st attempt, you can see by the coaches film, Mike Sherman has this one dialed up. 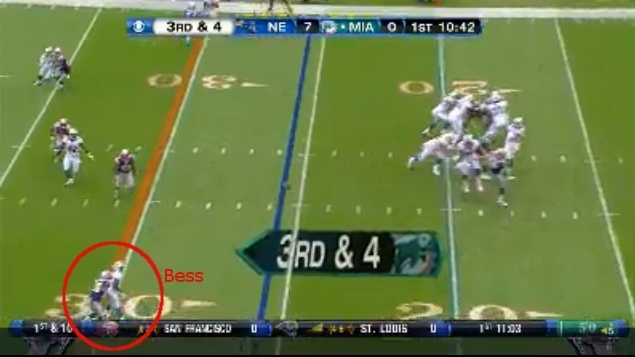 Davone Bess is wide open. See the 1st down marker, see the defender on the ground! Tannehill completely missed him. He threw it at Matthews' feet, uncatchable. On the next play, Fields bumbles a low snap and the Dolphins are looking like dolts. This is not coaching, the play calling was exceptional. 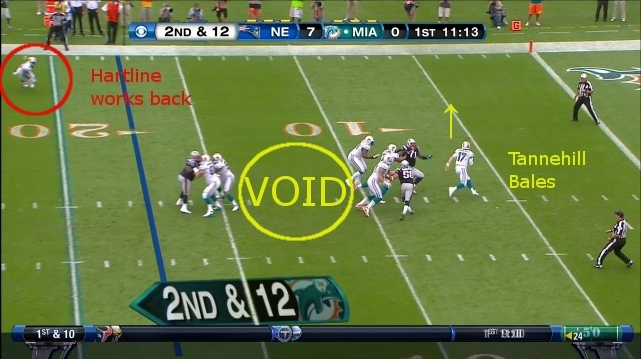 This is on Tannehill, both plays were perfectly schemed and wide open. We can't compare Mike Sherman to Dan Henning. The important thing to recognize here is the area in yellow. 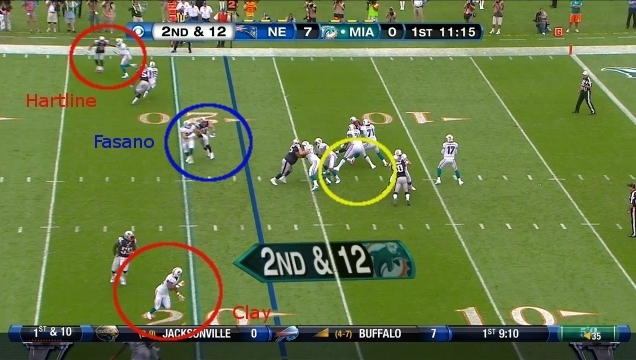 It looks like Tannehill is focused entirely on Fasano coming across the middle tightly covered. 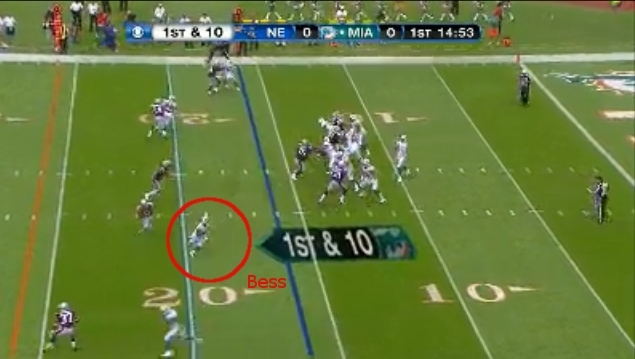 Hartline and Bess are both covered at the top, Clay is wide open, but Tannehill stares down Fasano. Tannehill has grown into a tendency to bale to his right, but this is ridiculous. There is so much space if he had taken one step up as the rush was coming, look back and forth between this and previous picture, one step and he has the amount of time associated with Tom Brady. Is this the lack of line play I hear so much about? Is this the poor play calling I hear about? No, sorry this is very poor play from the QB position, so if fans want to say the kid will grow into it, I'm okay with that, but put it where it belongs. Hartline ended up catching the ball on a come back to rescue Tannehill, but it was short of the 1st down and another punt. Please stop making excuses is all I ask. Hope this is rookie lack of understanding, hope Sherman and Philbin can coach Tannehill up, but please don't sugar coat what is right in front of your eyes. Okay, now you see why I'm only going to show the 1st 4 passes... It keeps getting more painful. Here's number 4. Look at Tannehill's head, we can't see his eyes but it's pretty obvious he's zoned in on Davone Bess. I don't know who the corner is, but he's got Bess locked up. Now look at the top, holy crap!!! Reggie Bush is in single coverage on a Linebacker and he is about to go house on a wheel route! But Ryan has decided come hell or high water he's throwing to Bess. 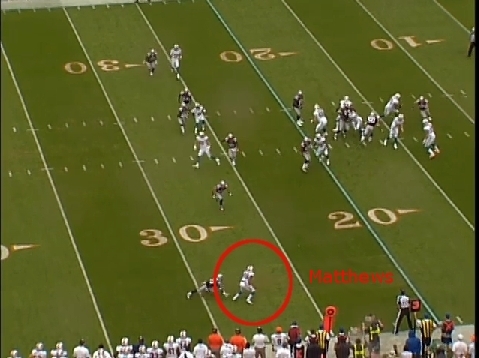 The ball is nearly picked because Tannehill decided prior to the snap which receiver he was throwing to. 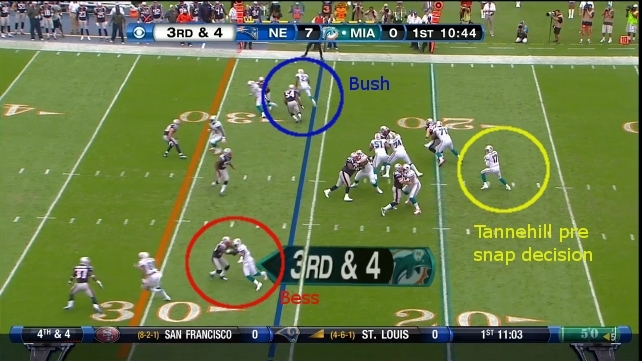 Again look in the pocket, one step forward and one step right and Tannehill has all day to find Bush. Tannehill needs to step up his game.